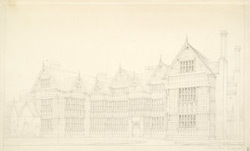 This pencil drawing depicts the magnificent half timbered facade of Park Place in Shropshire. The lack of records for this building indicate that it may no longer be in existence. It was similar in appearence to other superb tudor buildings found in the Welsh borders, such as Little Moreton Hall in Cheshire and Pitchford Hall in Shropshire.